Gustav Klimt’s name is indelibly associated with Vienna and its art. He was born, lived, worked and died in the city. Discover the best places to see his paintings and other creations. Use the map and slideshow to find the locations relevant to his life and work, including his studios, grave and final residence. If you’re in Vienna and interested in Klimt, then the Upper Belvedere gallery is probably your top priority. It’s home to The Kiss and other famous Klimt paintings such as Judith. This museum focuses on the work of Schiele, but also features a gallery dedicated to Klimt. It has, for example, some of the postcards he wrote and a reproduction of his studio. Works owned by the Leopold collection include Death and Life and Attersee. The Albertina museum has more art than you can shake a paintbrush at, but most of it is kept in storage. Their Klimt collection covers a vast number of drawings, but you may only be able to see Nymphs / Silver fish in its permanent exhibition. Anything more depends on their current exhibitions – you may get lucky. Gustav Klimt, Ernst Klimt (his brother) and Franz Matsch called themselves the “company of artists”. The public commission that really established their careers was a cycle of ceiling paintings for the two decorative staircases in the Burgtheater in 1887. You don’t have to see a play to get inside the building – there are guided tours, too. This is a summer residence built in the 1880s for Empress Elisabeth and now open to the public. Klimt worked with his brother and Matsch on ceiling paintings you can view in the Empress’s bedroom and salon. The art history museum is perhaps better known for its Titians and Tintorettos, but the Klimts and Matsch were commissioned to contribute to the decorative paintings around the huge main staircase. If you’re lucky, you’ll find a temporary stairs that lets you get up close to Klimt’s work. This was the exhibition building of the famous Secession group of artists co-founded by Klimt. Today, it is a contemporary art gallery and home to the Beethovenfries, a huge wall painting completed by Klimt for the 1902 Beethoven Exhibition. 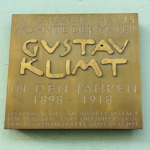 The slideshow features some of the main addresses relevant to Klimt’s life (and death) in Vienna. The only place you can actually go into is the Klimt Villa (his final studio, which he used from 1911 to 1918). Klimt was born at Linzer Strasse 247 in what is now Vienna’s 14th district. Unfortunately, nothing remains of the original house. His final residence was on Westbahnstraße 36 in the 7th district (there’s a plaque outside the building to commemorate it). There he suffered a stroke and was taken to the old general hospital on Alser Straße in the 9th district. He died on February 6th, 1918. The old hospital is now university buildings, bars and shops (and home to a Christmas market). If it doesn’t display properly, see here.